Italy; Early 15th Century. Latin Text; Rotunda Gothic Script, Gregorian Notation. The chanting of hymns during ecclesiastical rites goes back to the beginning of Christian services. 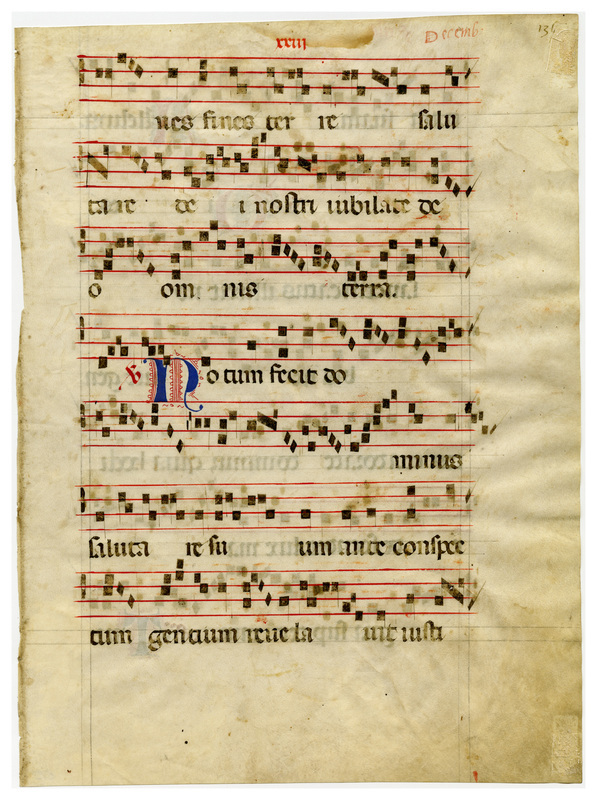 Antiphonal or responsive singing is said to have been introduced in the second century by St. Ignatius of Antioch. According to legend, he had a vision of a heavenly choir singing in honor of the Blessed Trinity in the responsive manner. Many of the more than four hundred antiphons which have survived the centuries are elaborate in their musical structure. They were sung in the medieval church by the first cantor and his assistants. Candle grease stains reveal that this small-sized antiphonal was doubtless carried in processions in dimly lighted cathedrals. In this example the notation is written on the four-line red staff which was in general use by the end of the 12th century. The script is the usual form of Italian rotunda with bold Lombardic initial letters. The chief visual interest is the four-line staves rendered in strong red ink; there are seven of these per recto or verso, and the Lombardic initials are sized to fit perfectly between them. The black ink used for the notes and the text is less substantial. The pages exhibit two forms of numbering: Roman numerals in the center of the top margin, and Arabic numerals in the upper right corner. Note: It is possible that Ege's manuscript contained components (individual leaves, bifolia, or gatherings) from diverse sources. Most of the Leaf 27s conform to the description above, but Leaf 27 in the Ohio State University and Rochester Institute of Technology portfolios are clearly different. (Porcheddu frag. 1 is a sister leaf to the Ohio State leaf). Either these leaves had been bound into Ege's antiphonal, or they were supplied for those portfolios from other sources without the substitution being noted. 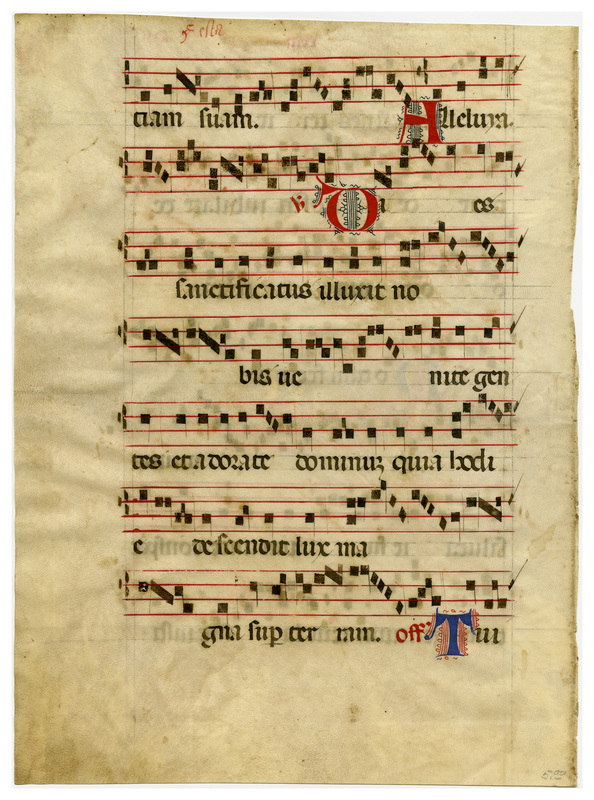 “E0027 Leaf from an Antiphonal (Antiphonarium),” Digital Exhibits | Denison University Archives & Special Collections, accessed April 23, 2019, http://exhibits.denisonarchives.org/items/show/49.